Quiche is a French savoury dish which usually has a crust which is filled with milk, eggs, cheese, meat, seafood and/or vegetables which becomes custard. In this recipe, we will not be making a crust; instead, we're cooking the custard in a mug using the microwave oven. • Roughly tear the bread slices. • In a mug, mix milk, egg, butter, salt and butter. Whisk well. • Add the chopped vegetables, cheese and herbs to the egg mixture. Do not mix it. 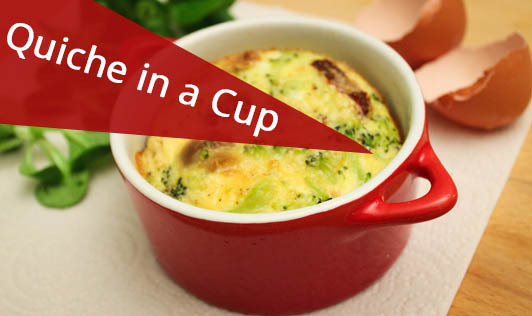 • Place it in a microwave oven and cook on high for 1 minute, just until the egg is completely cooked and the quiche is puffed.